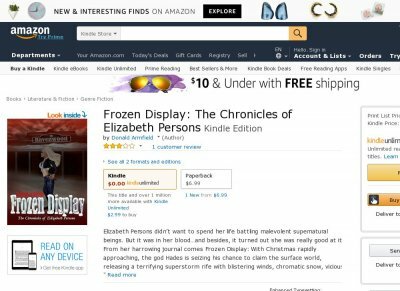 Elizabeth Persons didnt want to spend her life battling malevolent supernatural beings. But it was in her bloodand besides, it turned out she was really good at it. From her harrowing journal comes Frozen Display With Christmas rapidly approaching, the god Hades is seizing his chance to claim the surface world, releasing a terrifying superstorm rife with blistering winds, chromatic snow, vicious hailand deadly flesh-rending clowns Shes dealt with monsters before, but this time shes up against the Kingof the Underworld, clowning around with a hoarfrost covering.